Wonderful loft (70 m2) with large terrace. 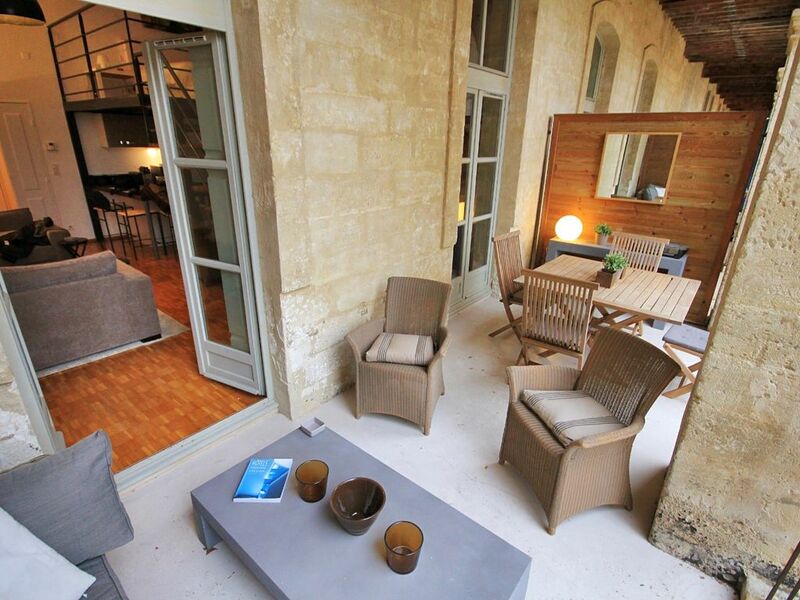 At the heart of the historic center of Avignon, this beautiful loft style apartment of charm and calm is found in the 18th century barracks building that became Le Clos des Arts in 1892 and is now a registered historical monument. You will be near the Place du Palais des Papes and the famous Pont d’Avignon, museums, theaters, shopping and all amenities of this historic old town. Within close walking distance are found many restaurants in different price ranges. This loft apartment at Le Clos Des Arts was completely renovated in 2013. It is on the 1st floor (French) with lift, private entry hall with closets, and a south facing terrace - balcony of 16m2 overlooking a large private courtyard with huge plane trees. The terrace is comfortably furnished with an outdoor dining suite, console and coffee tables, mirrors, and upholstered wicker furniture. This loft apartment of 70m2 was tastefully refurbished and decorated by its architect owner. It includes a large living room with sofas, flat screen TV, coffee tables, breakfast area with four stools, and a fully equipped kitchen. The main floor also includes a double bed and wardrobe. Upstairs, the loft has a queen bed, a desk and ample storage and hanging space. A separate bathroom on the main floor has a large shower, basin, WC, and a washing machine. Parking is available nearby, 200m from Le Clos Des Arts, at Les Halles for 35€ / week. - Caution / Security deposit : 300€ - Frais à payer à l'arrivée 50€ (Drap, serviettes et ménage) - Charges payable upon arrival € 50 (Sheets, towels and cleaning) En cas d'annulation, l'acompte n'est pas remboursé. In case of cancellation, the deposit is not refunded.